Reposted with thanks to original authors and sources. The passages, except a few too Offensive for the eye of the general reader, have been translated into English, but as a guarantee for the correctness Of the rendering, the original Latin, some short quotations excepted, is given in an appendix; with full references, so that they may be found in the works without difficulty by those who have them within reach. The public have a right to know the principles Of the Order which has been chartered and subsidized by the Government, and encouraged to extend its operations in the country. I feel satisfied that no unbiassed mind can study the extracts given here without being convinced that they practically teach the Obnoxious principle that the end justifies the means. The Superior General of the Society of Jesus is the official title of the leader of the Roman Catholic religious order, the Jesuits. He is generally addressed as Father General. The position sometimes carries the derogatory nickname of the Black Pope. 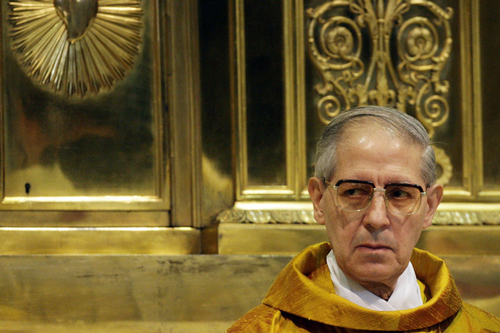 The current Superior General is the Reverend Father Adolfo Nicolás. 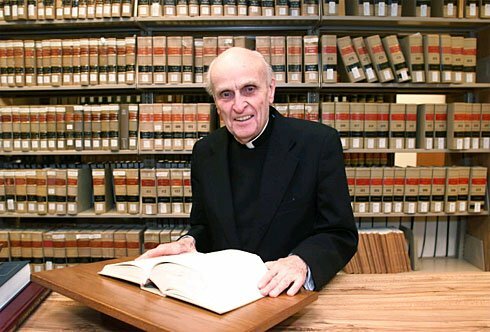 “We came in like lambs and will rule like wolves.” - Francesco Borgia, Third Jesuit Superior General. The Society of Jesus, more commonly referred to as the Jesuits, are the armed militia of the Roman Catholic Church. They were sanctioned in 1540 by Pope Paul III with one mandate: to defeat Protestantism and regain worldwide Papal rule. To achieve this monumental task, they employ ever-adapting methods of pseudo-education, social programs, infiltration, and all wickedness that could possibly be conceived. Needless to say, they are achieving great success in their mission, which is climaxing with the present pope, Pope Francis, i.e. the Eighth and last Pope of Revelation 17, who held some of the highest positions in Argentina, including Provincial Superior in the Society of Jesus and Archbishop of Buenos Aires. He was made a cardinal by Pope John Paul II. Today most of the world is oblivious as to how Jesuits operate, from their inception to this very day. Now more than ever, World’s Last Chance believes it is exceedingly important to bring up the following historical facts about this evil society, to expose the wicked nature of this truly malevolent order. It did not take long for the 18th Century Catholic nations to get tired of the meddling of the Jesuits into their national affairs. They were so infuriated against the Jesuits that they demanded the Roman Catholic Church abolish them once and for all. Sufficient political pressure was brought to bear on Pope Clement XIII. However, he passed away before he could do anything about it. The task of abolishing the Society of Jesus then fell on his successor, Clement XIV. As Clement XIV signed the decree abolishing the Jesuit Order he said, “I have signed my death warrant,…” Within nine months he was dead. [Many contemporaries considered his death a case of poisoning, and suspected the Jesuits were responsible]. Obviously the Jesuits were not expelled from many nations (even Catholic nations) because of their educational or charity work. They were expelled for engaging in and carrying out subversive political plots against humanity to advance their own cause. "Between 1555 and 1931 the Society of Jesus [i.e., the Jesuit Order] was expelled from at least 83 countries, city states and cities, for engaging in political intrigue and subversion plots against the welfare of the State, according to the records of a Jesuit priest of repute [i.e., Thomas J. Campbell]. Practically every instance of expulsion was for political intrigue, political infiltration, political subversion, and inciting to political insurrection." 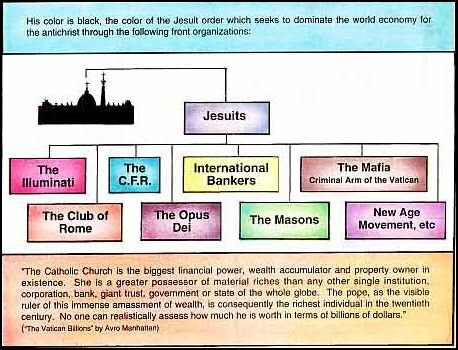 The Jesuits are known for their deception, spying, infiltration, assassination, and revolution. They worked deep into the political field and plotted through politics throughout the world countries. Source: Francesco Borgia, Third Jesuit Superior General. "…the SS organization had been constituted according to the principles of the Jesuit Order." Above all I have learned from the Jesuits. And so did Lenin too, "far as I recall. The world has never known anything quite so splendid as the hierarchical structure of the Catholic Church. There were quite a few things I simply appropriated from the Jesuits for the use of the Party. Source: Manfred Barthel, "The Jesuits: History and Legend of the Society of Jesus (New York, 1984), Adolf Hitler, p.266. 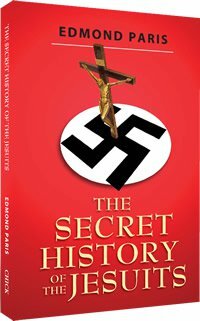 "I learned much from the Order of the Jesuits", said Hitler... "Until now, there has never been anything more grandiose, on the earth, than the hierarchical organization of the Catholic Church. I transferred much of this organization into my own party... I am going to let you in on a secret... I am founding an Order... 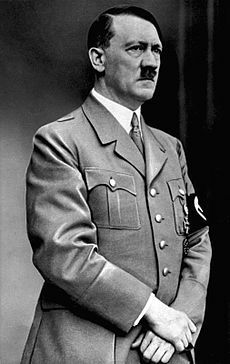 In my "Burgs" of the Order, we will raise up a youth which will make the world tremble... Hitler then stopped, saying that he couldn't say any more.. Signing the concordat is Cardinal Pacelli (later to become Pope Pius XII). By 1933 he was the Vatican Secretary of State. 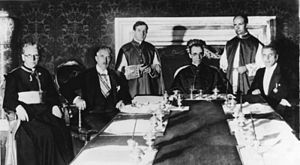 Second from left is Franz von Papen, a sinister Nazi and devout Roman Catholic who was Hitler's ace diplomat and the Vatican's agent in helping to bring Hitler to power. Standing at the far right can be seen the little-known Vatican prelate, Montini, later to become Pope Paul VI. Source: "Hermann Rauschning, former national-socialist chief of the government of Dantzig: "Hitler m'a dit", (Ed. Co-operation, Paris 1939, pp.266, 267, 273 ss). "The Fuhrer had come to power, thanks to the votes of the Catholic Zentrum [Center Party overseen by Jesuit Ludwig Kaas], only five years before 1933, but most of the objectives cynically revealed in Mein Kampf were already realized; this book . . . was written by the Jesuit controlled Father Bernhardt Stempfle and signed by Hitler. For . . . it was the Society of Jesus which perfected the famous Pan-German programme as laid out in this book, and the Fuhrer endorsed it." 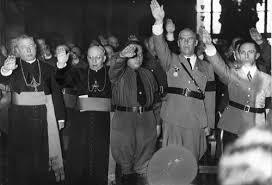 Franz von Papen, another powerful Nazi, who was instrumental in setting up the concordat between Germany and the Vatican had this to say: "The Third Reich is the first world power which not only acknowledges but also puts into practice the high principles of the papacy." Over the last 400 years the Jesuits have succeeded in establishing the largest worldwide network of schools and universities. These prominent schools and universities, have produced many well known alumni. Thus, the Jesuits have been able to shape and mould the thinking of many famous world leaders, and produce generations of political and religious leaders who were favorable to the Roman Catholic Church, and her doctrinal agenda. Heads of states were assassinated by the Jesuits, when they attempt to suppress the influence and meddling of the Jesuits in their national affairs. 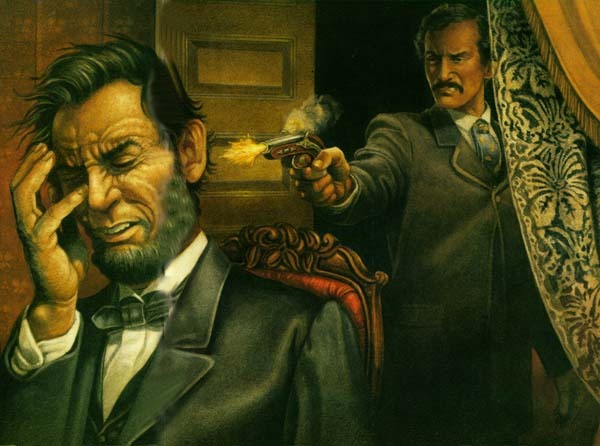 Of heads of states that are known to have been assassinated by Jesuits we mention for example: William of Orange, Kings Henry III and Henry IV of France, Czars Alexander I and Alexander II of Russia, President Abraham Lincoln and John F. Kennedy, and Mexican President Benito Pablo Juarez. “It is of faith that the Pope has the right of deposing heretical and rebel kings. Monarchs so deposed by the Pope are converted into notorious tyrants, and may be killed by the first who can reach them. President John F. Kennedy was another victim of appalling Jesuit wickedness. Once he outwardly distanced himself from the Papal agenda and stood for more liberal ideals and human rights, he was considered, by their standards, a traitor to the Vatican and a “tyrant” worthy of death. 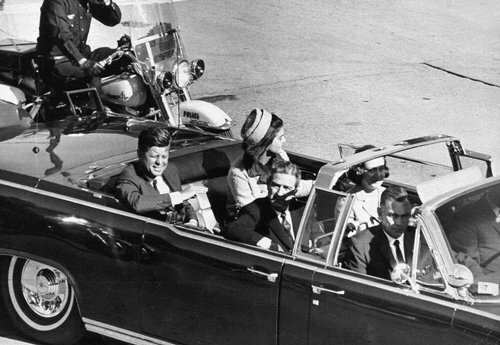 Knowing that President Kennedy was not going to escalate the Vietnam War, the Intelligence Community began to prepare for his assassination. . . . Cardinal Spellman [Francis Spellman, Archbishop of New York from 1939-1967], through FDR, had arranged the release of “Lucky” Luciano . . . Now the Cardinal needed a favor. If refused, Spellman could use the entire intelligence community which he had helped to organize, to eliminate any mob boss. If agreed to, new gambling centers would open up, Atlantic City in particular. Clearly, if the President [JFK] was removed, everybody would acquire more power and wealth, the intelligence community would become more absolute, and the Cardinal would be even more respected by his peers in Rome. And why did the Vatican’s Jesuits not want any arms sales to Israel at this time? Why did the Jesuit-controlled President Johnson turn his back as the Egyptian army moved up through the Sinai desert to prepare its assault on Israel in 1967? Because the attack upon Israel had to be provoked. That attack was provoked by the Jesuits’ International Intelligence Community through Egypt falsely perceiving the weakness of the Israeli army and the supposed abandonment of Israel by the American Empire. The six-day war, engineered by Knight of Malta James Angleton, had one primary purpose: the taking of Jerusalem along with the Temple Mount. The apparent lack of military hardware on the part of Israel provoked the planned attack by Egypt. Therefore, Israel launched a preemptive strike and, in six days, the holy city was in the hands of Rome’s Zionist government. It is safe to say that the Jesuit General, using the Pope with his most powerful Cardinal, [assassinated President Kennedy]. One might assume that this emotive painting would hang somewhere in Dallas, Texas or perhaps in the Smithsonian. And one would be wrong on both counts. 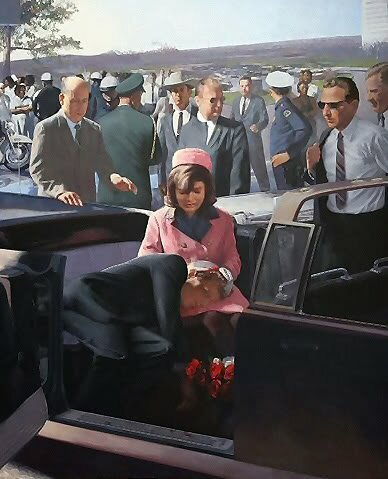 This painting of President John F. Kennedy's gruesome assassination, by Mark Balma, hangs in the Vatican Cathedral of St. Paul. The painting is entitled “Pietà” after Michelangelo’s famous sculpture of Mary holding the body of the crucified Christ, which is also located at the Vatican. Isn’t this a macabre way to “celebrate” the life of perhaps America’s most beloved President? or is this rather an homage to the Jesuit agenda, serving as a stern warning/reminder to those willing to cross them? "There are still …[men and women] about the country, who will tell you, with grim gravity that, if you trace up Masonry, through all its Orders, till you come to the grand tip-top, head Mason of the world, you will discover that the dread individual and the Chief of the Society of Jesus are one and the same person!" Source: James Parton, 1855, American Historian, The Black Pope, M.F. Cusack, (London: Marshall, Russell & Co., 1896) p. 76. If the above is true, than the example below would be a meeting of two of the most powerful men on Earth! 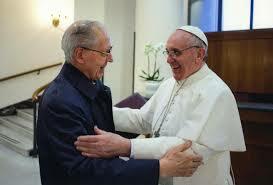 The Head of the Jesuits and the Pope, who is also a Jesuit. Father General Nicolás [Superior General of the Society of Jesus/Jesuits] meets with Pope Francis and wrote of his experience. The documented atrocities committed by the Jesuits, particularly those under the Ustachi (or Ustaše) are particularly disturbing and shocking, especially since there are actual photographs of such evil. This didn’t happen hundreds or thousands of years ago. It happened in the 1940’s! 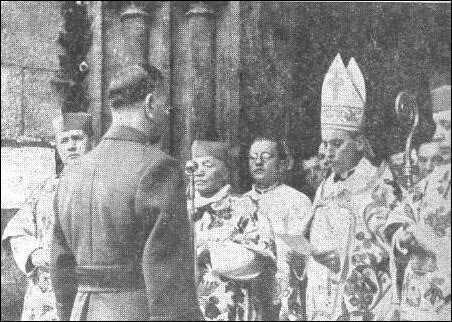 Here are a few links to some of the nothing short of satanic genocide the Ustachi carried out under the rule of Ante Pavelić, a Catholic Croatian fascist leader, who occupied part of Yugoslavia for Fascist Italy and Nazi Germany, and ultimately for the Papacy. For many in Yugoslavia it was either convert to Catholicism or be brutally tortured and killed. The papacy suffered great humiliation at the hand of Napoleon. 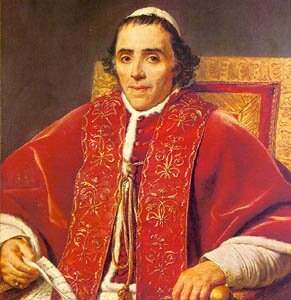 Thus, right after the defeat of Napoleon in 1814, Pope Pius VII was freed from imprisonment and was returned to Rome. The need to restore the Jesuit militia became an urgent matter. Rome did not want to be deprived again of the services of the Jesuits, no matter how burdensome this service was to the Church of Rome, and its allies. 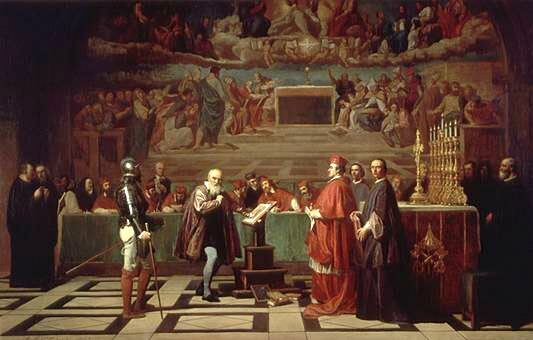 In 1254 Pope Alexander IV established the Office of the Inquisition. The first inquisitor was Dominic, who was the founder of the Dominican order of monks. However, shortly after Pope Paul III sanctioned the Society of Jesus, the Office of Inquisition was revived and the Pope gave free reign to the Jesuits to run this office, and the inquisitor Generals were granted exceptional powers in carrying out their mandate to root out of all “heretics.” This caused the martyrdom of millions of saints. Source: Cushing B. Hassell, History of the Church of God, Chapter XVII. Source: John Lord, Beacon Lights of History, volume VI, p. 325. Source: Henry H., Pocket Bible Handbook, Chicago, 13th edition, 1939, p. 790. 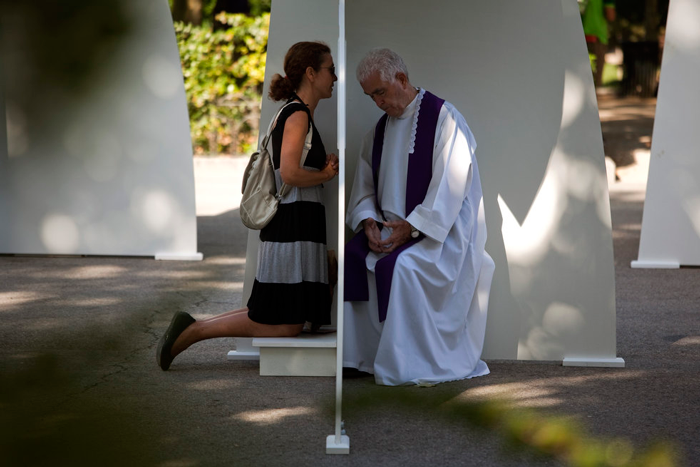 “The Jesuits became the predominant group supplying confessors to (meaning, hearers of the confessions of) kings and princes and those in authority. As the New Catholic Encyclopedia says, "they acted as royal confessor to all French kings for 2 centuries, from Henry III to Louis XV; to all German emperors after the early 17th century; to all Dukes of Bavaria after 1579; to most rulers of Poland and Portugal; to princely families throughout Europe. 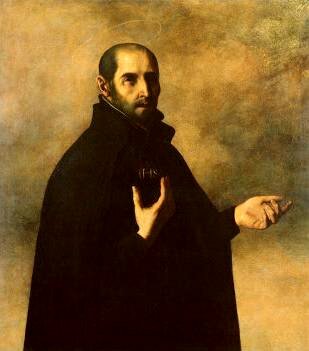 Ignatius Loyola - Jesuit Founder - by Francisco Zurbaran. Given the above historic facts about the Jesuits, it is incredulous and most shocking to see the media and the world’s religious and political leaders stampeding to endorse and praise Pope Francis. We have no words to describe this unprecedented worldwide epidemic of memory loss towards Rome and her Jesuits. Source: General Sherman’s Son: The Life of Thomas Ewing Sherman, S.J., Joseph T. Durkin, S. J., (New York: Farrar, Straus and Cudahy, 1959) p. 186. Praise His name for ever and ever! !